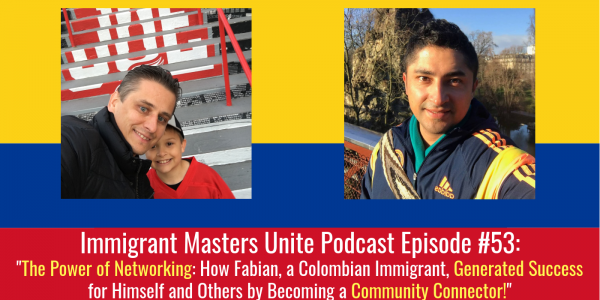 IMU 053: The Power of Networking: How Fabian, a Colombian Immigrant, Generated Success for Himself and Others by Becoming a Community Connector! | Immigrant Masters Unite Podcast: Transform Your Business, Life and The World Around You! Do you ever feel disempowered in your business, career or just your life for that matter? Do you think you that can easily connect with others? Have you ever tried networking or becoming a connector to build your business? if so, then listen to this episode of Immigrant Masters Unite. Hi, this is Polish Peter and welcome to episode 53 of Immigrant Masters Unite. Today, I have Fabian Toledo, a Colombian immigrant who found great success in real estate thanks to his resilience and attitude. He saw his situation of being an immigrant and having a language barrier as an advantage rather than a struggle because it gave him drive and motivation. Now, not only does he flip houses, but he flips his success back to the Latino community through his networking group, where he connects people to one another and gives them powerful insight on how they can thrive in real estate. This is a great example of the power of networking and how you can use it to overcome various challenges. A lot of people see a language barrier as an disadvantage. Listen as Fabian uses the language barrier as an advantage and how he empowers others to do the same. This is a great way of looking at life. The significance of knowing your audience in your business. I keep bringing this topic up because it is so important when it comes to being successful in business. In fact, I recorded an episode on figuring out your perfect audience here. Check it out here, it’s episode 11 of the Immigrant Masters Unite. How to start a new venture and do it the right way. A lot of people get hung up on starting a new venture and it doesn’t have to be a difficult transition. Listen and apply the strategies Fabian shares in this episode. And who the best professor, the teacher in life really is and how to listen to him in order to grow in life and business.